With the recent release of the beastly burger-burrito hybrid called the Whopperrito and the absurdly cheesy Mac n' Cheetos, it's safe to say Burger King is throwing its crown into the stunt food ring largely dominated by Taco Bell. Now, it looks like the burger chain is taking another greasy page out of T-Bell's playbook with the release of a new Doritos-filled cheeseburger. 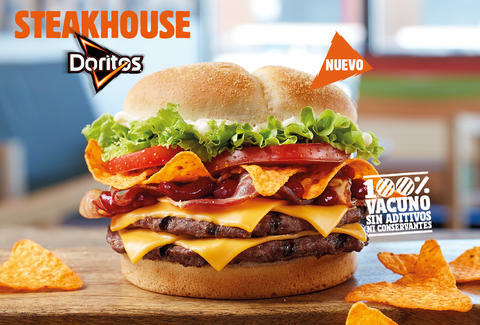 The new burger, simply dubbed Steakhouse Doritos, is made with your typical cheeseburger ingredients -- two meat patties, American cheese, lettuce, tomato, bacon, and mayo -- but with the shocking addition of nacho cheese-flavored Doritos, according to a report by The Street. Basically, it's Burger King's version of Doritos Locos, and it looks amazing. But don't get too excited about eating one any time soon. As the report explains, Burger King parent company Restaurant Brands International is currently -- and perhaps inexplicably -- testing the new snack-cheeseburger hybrid at the chain's restaurants in Spain, where it'll be available through November 21st. That's right, the crowned burger chain chose a European country over the US to test a Doritos-filled fast food abomination. We're scratching our heads, too. Thankfully, the Steakhouse Doritos doesn't look too hard to recreate with Burger King's existing menu and a bag of Doritos. Just order a Bacon Double Cheeseburger (give or take a few toppings) and you can add a nice layer of Doritos above the bacon yourself. Be sure to carry out this process in the privacy of your home. We reached out to a Burger King spokesperson for more information. Tony Merevick is Cities News Editor at Thrillist and would absolutely eat one of these things. Send news tips to news@thrillist.com and follow him on Twitter @tonymerevick.